The Mens Bridgeport Bay Jacket from Jack Wolfskin provides Eco-friendly weather protection and a contemporary, field Jacket style. Our Bridgeport Bay Jacket is made of recycled materials and is smart enough to wear to the office. And In case you were wonderIng, it's also completely waterproof.It has a sLightly longer cut that covers your suit Jacket and keeps you dry on the way to your out-of-office meetIng. The High performance synthetic fibre Insulation is made of recycled PET bottles and ensures you stay warm when you're out and about In Winter weather. 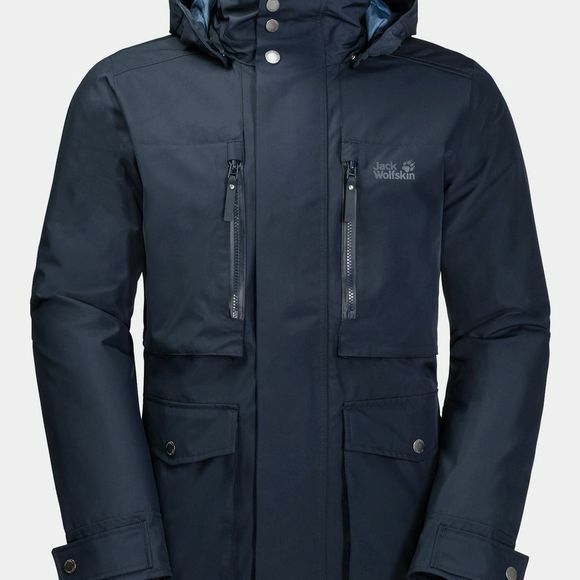 The Jacket has a detachable Hood, seven pockets and a waist draw cord that allows you to customise the fit.